JENNiRADIO is a music format specifically for tweens and teens, but younger kids and parents will like it too! For Kids… By Kids ® radio format, founded and programmed by 16-year-old Jennifer Smart. It includes not only fun popular music, but also content you will find nowhere else, like Jennifer’s interviews with Miley Cyrus and tons of Disney and Nickelodeon stars. We are pleased to have Bob Perry, developer of the variety hits radio format, working with us in developing and implementing JENNiRADIO. From 2003 to 2008, Jennifer was the youngest nationally-syndicated radio talk show host. Starting at the age of six, she was heard, along with her parents, on a three-hour weekly show, which started out as the Family Tech Show. 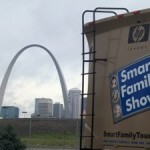 In 2007, they took the show on the road, re-naming it the Smart Family Show, and toured 48 states. They broadcast from a different theme park, museum or historical landmark each week, and were heard by approximately 1 million listeners on 40 radio stations around the country. In 2005, when Jennifer was only 8 years old, she began interviewing celebrities on the red carpet at Hollywood movie premieres. One of her first interviews was with Michael Keaton at the Herbie: Fully Loaded premiere. Since then, she’s reported on more than 100 red carpets and other events. Jennifer has interviewed more celebrities and industry insiders than anyone else her age. Jennifer is the only minor to broadcast live from the Consumer Electronics Show four years in a row. 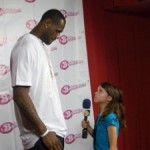 She’s also the only kid to do live broadcasts from E3 and the All Candy Expo. In 2008, after returning from her nationwide tour, Jennifer decided to take a break from doing a weekly radio show and focus on her acting career and the development of JENNiRADIO. Since she became a host of All Star Planet, a singing contest for kids that benefits charities, Jennifer has started attending and reporting on charity events in addition to entertainment events. 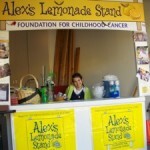 She is happy that she has another outlet to help her support Alex’s Lemonade Stand Foundation. Jennifer has many other projects in the works, which will provide more experiences for her to share on JENNiRADIO including TV projects in development. JENNiRADIO features only clean and/or edited versions of popular songs, so that our content is age appropriate. Please be careful when purchasing music for your kids, because edited versions of these songs may not be available from normal retailers. Also, although we encourage your kids to contact Jennifer, the only information we keep for contesting purposes is a first name and email address, which is preferably that of a parent.